Reading and share top 13 famous quotes and sayings about Islamic Mecca by famous authors and people. Browse top 13 famous quotes and sayings about Islamic Mecca by most favorite authors. 1. "As a result of the awareness and consciousness of decline, an awareness and consciousness of a national ethnicity or an Islamic identity also came into being." 2. 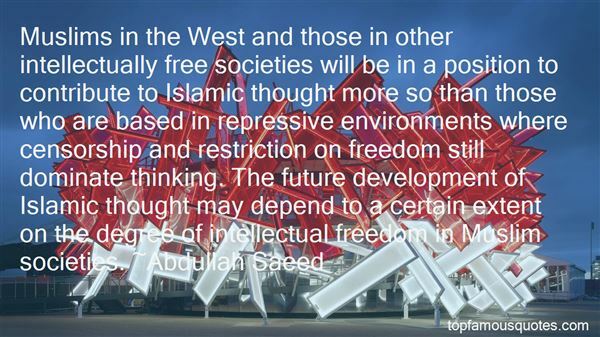 "Muslims in the West and those in other intellectually free societies will be in a position to contribute to Islamic thought more so than those who are based in repressive environments where censorship and restriction on freedom still dominate thinking. The future development of Islamic thought may depend to a certain extent on the degree of intellectual freedom in Muslim societies." 3. "Beyond that, many Saudi citizens want a more open society, still devoutly Islamic but free of some of the restraints imposed by religious fundamentalists and absent the daily harassment of the religious police." 4. "I'm a fundamentalist in the true sense. That is to say, I follow the fundamentals of religion... But for over 1,400 years people have been interpreting and re-interpreting the religion to suit their own purpose! ... These [extremist and terrorist acts] are not Islamic fundamentals any more than the Christians who burned people at the stake are fundamentalist. They are actually deviating from the teachings of the religion!" 5. "Muhammad introduced the concept of such Glorious and Omnipotent God in Whose eyes all worldly systems are pieces of straw. Islamic equality of mankind is no fiction as it is in Christianity. No human mind has ever thought of such total freedom as established by Muhammad." 6. "During his hajj, Malcolm [Malcolm X] fell into a new Islam with the same blind faith that he had given to Elijah. Since he lived just a year after his hajj, Mecca became the neatly presented and cinema-friendly conclusion to his lifelong thread of transformations: but he finally found the Truth and then Allah took him home. But if he lived longer, I think he would have called out the Arabs." 7. "Inciting women to rebel against the divine laws of Islam.' This became the accusation that was leveled against me whenever I wrote or did anything to defend the rights of women against the injustices widespread in society. It followed me wherever I went, step by step, moved through the corridors of government administrations year after year, irrespective of who came to power, or of the regime that presided over the destinies of our people. It was only years later that I began to realized that the men and women who posed as the defenders of Islamic morality and values were most often the ones who were undermining the real ethics and moral principles of society." 8. "Radical Islamic fundamentalists harbor contempt for our democratic way of life and, given the opportunity, will stop at nothing to accomplish their goal of bringing our country to its knees." 9. "The Islamic Reformation is already here. We are all living in it." 10. "Islam's borders are bloody and so are its innards. The fundamental problem for the West is not Islamic fundamentalism. It is Islam, a different civilisation whose people are convinced of the superiority of their culture and are obsessed with the inferiority of their power." 12. 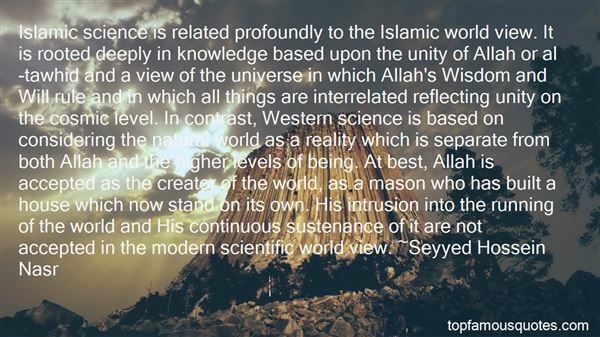 "Islamic science is related profoundly to the Islamic world view. It is rooted deeply in knowledge based upon the unity of Allah or al-tawhid and a view of the universe in which Allah's Wisdom and Will rule and in which all things are interrelated reflecting unity on the cosmic level. In contrast, Western science is based on considering the natural world as a reality which is separate from both Allah and the higher levels of being. At best, Allah is accepted as the creator of the world, as a mason who has built a house which now stand on its own. His intrusion into the running of the world and His continuous sustenance of it are not accepted in the modern scientific world view." 13. "I write against the religion because if women want to live like human beings, they will have to live outside the religion and Islamic law." I started off for home, where I planned to recruit a good book and hide away from the world."